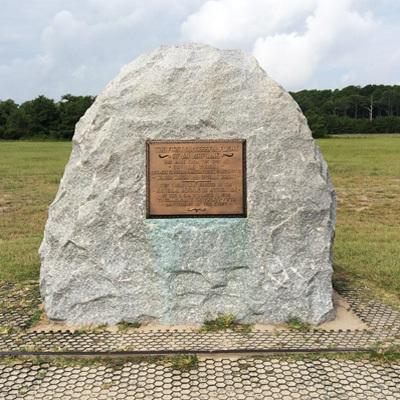 The memorial marking the first successful flight of an airplane is a six foot four inch high granite boulder with a bronze tablet. North of the marker there are four granite boulders and replica 60-foot monorail commemorating four successful flights by the Wright brothers made on the morning of December 17, 1903. Along the bottom of each of four markers is a drawing identifying the lift-off point, the length of the first flight (12 seconds, 120 feet), the length of the second flight (12 seconds, 175 feet), the length of the third flight (15 seconds, 200 feet), and the length of the fourth flight (59 seconds, 852 feet). Each boulder is numbered. THE FIRST SUCCESSFUL FLIGHT OF AN AIRPLANE WAS MADE FROM THIS SPOT BY ORVILLE WRIGHT DECEMBER 17, 1903 IN A MACHINE DESIGNED AND BUILT BY WILBUR AND ORVILLE WRIGHT. 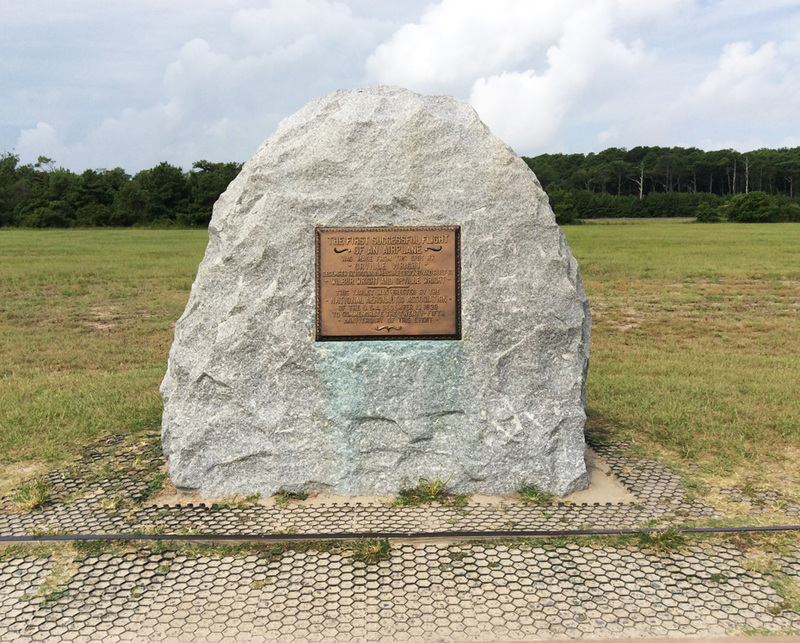 Friends and family of the Wrights, 200 delegates from the International Civil Aeronautics Conference, and over 3,000 visitors dedicated this marker at the approximate site of the 1903 liftoff. The ceremony also included the laying of the cornerstone atop Kill Devil Hill for the Wright Memorial. Orville Wright made the first flight in an airplane on December 17, 1903. The exact location of the first flight was debated because the dunes had shifted over time. Using accounts of the flight and surviving witnesses the location was determined. The title of first in flight has been contested by other individuals, particularly Glenn Curtiss in the United States, as well as Alberto Santos-Dumont in France. The memorial marker is located on the Outer Banks of North Carolina at Kill Devil Hills. The park address is 1000 N. Croatan Hwy., Kill Devil Hills, NC. It is located north of the Wright Brothers National Memorial and the First Flight Centennial Memorial. The memorial stands on a wide open field. On December 17, 2003, the centennial of the first flight, a ceremony was hosted by John Travolta and attended by President George W. Bush, Neil Armstrong, and Buzz Aldrin.